Now onto this recipe!! Who doesn’t love a coffee cake? They are probably one of my favorite breakfast treats. 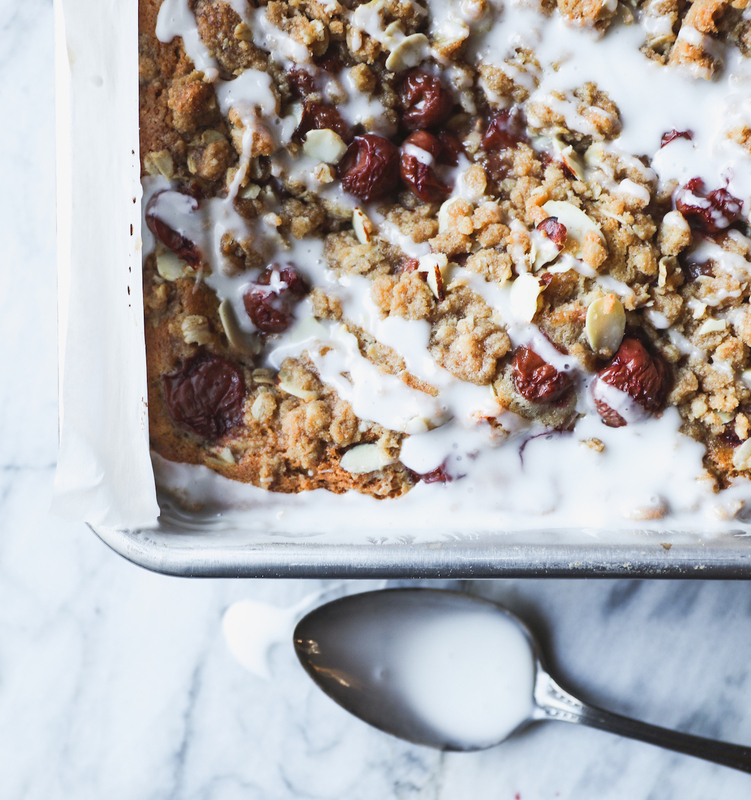 I was super excited to bring you this delicious (and easy) cherry streusel coffee cake that’s loaded with tart cherries, topped with a thick oat-almond streusel lid and a quick drizzle of glaze. She’s such a lovely and accommodating coffee cake she’ll even let you assemble her the night before, stash in the fridge and bake first thing in the morning making her (we’re still talking about the coffee cake) the perfect holiday breakfast treat for entertaining. 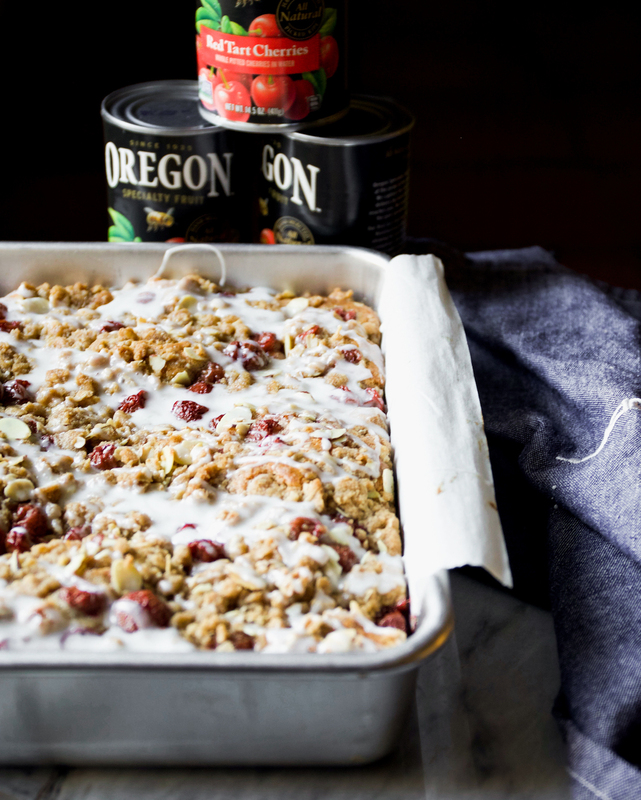 I’m super excited to partner with Oregon Fruit Products as they are one of my favorite canned fruits since childhood. They are what my mom used (and uses) for her cherry pies and now they go in my cherry pies. Oregon Fruit is packed in the summer at peak ripeness and is perfect for using during the winter months when fresh fruit isn’t as avail. When I was living in China, I used to bring cans of it from the US to have on hand for emergency Beijing pies…which were much needed. I hope you’re all having fun in the midst of holidaying and things aren’t too crazy. 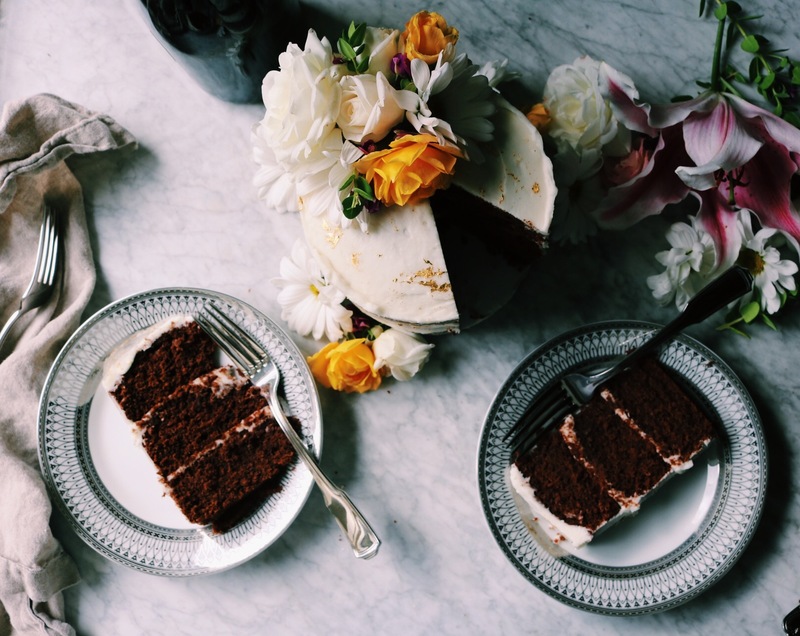 Promise me you’ll take a minute to relax and pause and breath and eat cake with friends. It’s good for the soul. Make Ahead. Nothing gives me greater joy than make-ahead everything. Especially if I’m entertaining and especially if it involves breakfast. Thomas Keller has a recipe in his Bouchon cookbook for cornbread muffins and he has you rest them in the fridge overnight prior to baking. They were such a revelation for me in my baking career and it was the start of me really using the cool fridge temps to my advantage. It won’t mess with your leavening, I promise. What you may lose in added leavening power, you gain in the batter moisture getting absorbed into the flour and making things nice and puffy. Trust me on this. You’ll assemble it up until the point of getting the batter into the greased pan, wrap it tightly and stash it in the fridge. Store your streusel in the fridge separately overnight. Streusel. I love to give my streusel a nice chill prior to baking which is why we make it first. Don’t skip this. Almonds. Some people are nut sensitive or just don’t like them…you’re fine to omit. But they look so pretty and I love the crunch if you’re on the fence. Cake Flour. I wanted this cake to be really light. You can always sub 1 cup of flour (with 2 tablespoons of flour taken out of it) + 2 tablespoon of cornstarch for 1 cup of cake flour. So this cake would take 3 cups of all-purpose flour with 6 tablespoon of all-purpose flour removed and 6 tablespoons of cornstarch added in. But, cake flour is easy and at most stores so consider it…it’s great!! Baking Vessel. If you go up or down in the pan size you will need to bake it more or less, so keep an eye on things if you get crazy with this. Cherries. I used the Oregon Fruit Product Tart Cherries and instead of folding them into the batter, I sprinkled 3/4 of them over the top of the batter, sprinkled the streusel and then sprinkled the remaining 1/4 of cherries over the top. I like to give people an idea of what flavors they’re biting into. This also makes it so that every bite has a cherry in it. Yes…that’s what we’re looking for. Let’s get our cherry streusel coffee cake on, shall we? Preheat your oven to 350F. Grease an 8×11 baking dish and line with parchment, letting the excess hang over the sides (you’ll use this to pull the cake out of the pan). In a medium bowl, whisk together the flour, oats, brown sugar, cinnamon, nutmeg and sea salt. Using a pastry blender or your hands, work the butter into the mixture until it resembles wet sand and when pinched together it holds into clumps. Gently mix in the almonds and place in the fridge. If storing overnight, cover with plastic wrap; otherwise it’s fine for an hour-ish. In an electric stand mixer fitted with the paddle attachment (or use a bowl and spoon) mix the butter and sugar on medium until light and fluffy or about 5-6 minutes. You want it pretty fluffy, so if your kitchen is chilly let the machine run longer. Scrape down the sides and bottom of the bowl to make sure everything is the same consistency. Add in the eggs, one at a time, making sure the first is well blended before adding in the second. Add in the vanilla and run the machine for 1 minute more. In a medium bowl whisk together the cake flour, cinnamon, baking powder, baking soda, salt and then add half to the mixer and run the machine until it’s almost blended. Add in half of the milk and run the machine until almost blended. Repeat with the remaining flour mixture and milk. Scoop the mixture into the prepared pan smoothing the top a bit with the back of a spoon/spatula so that it’s even. Sprinkle with 3/4ths of the cherries, cover with the streusel (there’s a lot!) and then sprinkle with the remaining cherries. Bake in the center of the oven for 50 minutes. The center will be soft, maybe a slight jiggle, but set. The top and exterior should be nicely bronzed. Let cool on a cooling rack for 15 minutes and then use the parchment handles to remove it from the pan so that it can finish cooling out of the pan. If it resists coming out run a knife around the edge to help it along. Additionally, you can let it cool longer in the pan if you’re having a hard time getting it out. Don’t stress. While the cake cools, whisk up your powdered sugar and milk to make the drizzle. You want it pretty thick so the bright white shows up over the top and then drizzle it all Jackson Pollock like over the top. Cut and serve. And enjoy. Have a wonderful day!! Wishing you all a wonderful weekend/week — I hope you find a wee minute to rest, chill, bake coffee cakes and relax. Heaps of love to you! 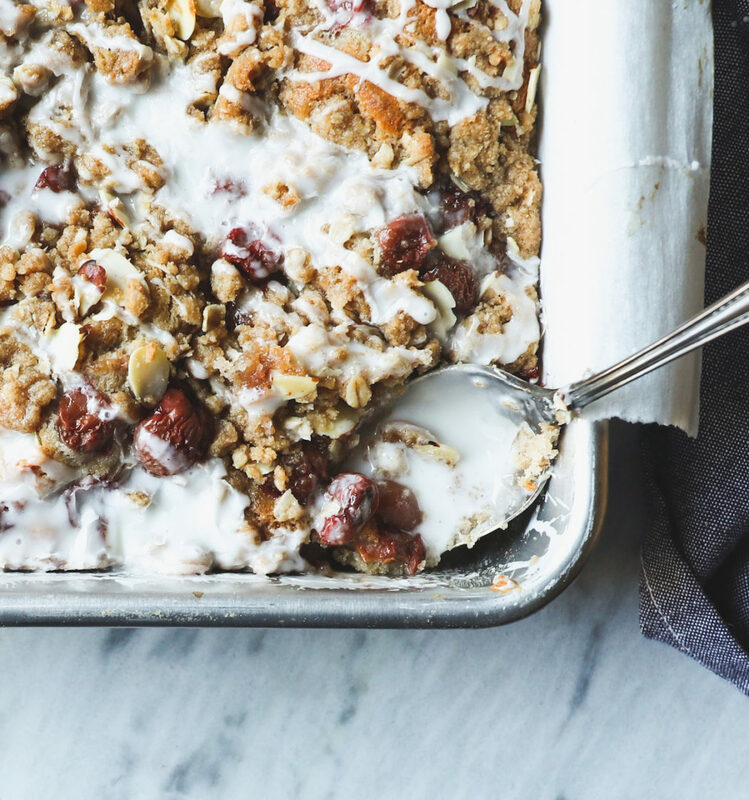 This delicious (and easy) cherry streusel coffee cake is loaded with tart cherries, topped with a thick oat-almond streusel and a quick drizzle of glaze. Preheat your oven to 350 F. Grease an 8x11 baking dish and line with parchment, letting the excess hang over the sides (you’ll use this to pull the cake out of the pan). Scoop the mixture into the prepared pan smoothing the top a bit with the back of a spoon/spatula so that it’s even. Sprinkle with ¾ths of the cherries, cover with the streusel (there’s a lot!) and then sprinkle with the remaining cherries. While the cake cools, whisk up your powdered sugar and milk to make the drizzle. You want it pretty thick so the bright white shows up over the top and then drizzle it all Jackson Pollock like over the top. Cut and serve. Oh how I love French Toast for breakfast. This could be the best breakfast ever if I can pull off vegan caramel rolls this year for my daughter!! My favorite holiday breakfast is bacon, eggs and home fries. Love cinnamon rolls for Christmas morning. Honestly it is your cranberry spice breakfast buns! They are a holiday tradition for us now :) along with some kind of veggie scramble and crispy bacon. My favorite holiday breakfast is either pie or bread pudding from the night before. This looks so deliciously beautiful! Our family has a tradition of a mimosas, savory egg strata, fresh fruit, Danish Kringle and Christmas cookies. We are a third-generation Oregon fruit family. My mother used them, I always have, and now my daughter does, too! We usually have a light breakfast of orange cranberry muffins or pumpkin bread, plus coffee and tea. Merry Christmas! Ham and egg casserole with cranberry citrus fruit salad the side. A homemade Orange Julius makes it complete! Hmmmm… chile relleno breakfast casserole! Overnight french toast made with day old donuts! Our Christmas morning tradition. Boozy overnight French toast with Bailey’s! Most certainly leftover pie and bacon!!! Definitely has to be a Filipino Ham that’s been crusted with a brown sugar crust on Pan de Sal (filipino sweet roll) with a light smear of mayo. Sounds like a lot for breakfast but it’s the best combination of sweet and salty! My fathers pancakes and pure apple syrup! Cinnamon rolls, bacon, and coffee! Chocolate cake and ham biscuits! Growing up France, my mom made sure we had croissants with our hot chocolate on Christmas morning so I do that for my kids now. It brings me back to happy childhood memories. A friend gives out cinnamon rolls when she is in town, so we sometimes also enjoy those, and another friend likes to bring us stolen if she makes it to Black Cat bakery in Montana. It’s all good! French toast with bacon and hash browns and orange juice! We start Christmas morning with cinnamon rolls but I may have to give this recipe a try. Yum! My favorite holiday breakfast is Quiche Lorraine and Blueberry Muffins. The photo had me hooked! I have to make this recipe. It looks so delicoius! Thank you so much for the step-by-step instructions. I love cinnamon rolls for Christmas breakfast! Thanks for the chance! I always make cinnamon rolls for Christmas morning. I am going to make this. I think my family will love it. Crepes. Should make them more times of the year but they are a holiday tradition. My mom has been buying a chocolate coffee cake from Deerfield Bakery in Deerfield IL for over 50 years. Wouldn’t be Christmas without it! My favorite holiday breakfast is hashbrown casserole , bacon and fresh fruit! My mom’s egg dish recipe and cinnamon rolls! Biscuits and gravy with hash browns is my favorite holiday breakfast. Thanks for the contest! Cinnamon rolls and strong coffee! Warm from the oven scones and a hot cup of coffee! Overnight French toast with blueberries…I’d use cherries tho! but for Xmas, it’s a given we have this!! Breakfast cassorole! With sausage and my mom’s orange jello! It is French Toast Casserole! You can do almost any type of topping with French Toast, so set up a little topping station! Giant cinnamon rolls and great coffee! We always have stuffed French toast. Cinnamon rolls!! The only time of the year I let myself eat them! Homemade cinnamon rolls! Christmas tradition every year. This looks delicious! I love my moms marathon muffins – bananas, chocolate chips, coconut, and walnuts! I love French toast casserole for Christmas breakfast, although I might have to try this! I love all the overnight breakfast casseroles. To be totally honest, my fav is homemade pie and coffee. Isn’t that why we bake them beforehand??? Japanese soufflé pancakes!!! They are amazing! My grandmother’s Swedish cinnamon rolls! I love miso soup and rice and soft boiled eggs!!! Everyone’s breakfast sounds yummy! We have leftover Polish mushroom soup from the night before followed by homemade Christmas stollen and an English Simnel Cake….the soup is never planned but no one can get enough. Strange traditions repeat themselves!!! Happy holidays! What a great giveaway, and this coffee cake looks fantastic! I always make too much for Christmas breakfast… monkey bread, scones, cinnamon rolls, egg bake. Always looking to try a new breakfast treat! Love coffee and scones for breakfast! Cake is good too!! My favorite holiday breakfast is Puffed apple pancake with fresh whipped cream. Our traditional christmas breakfast has been monkey bread, but I think we might be switching to these amazing brown butter cinnamon rolls I’ve been making lately. But for me, something savory. So our favorite would be split: cinnamon rolls and maybe a quiche/frittata. And Christmas mimosas! Prosecco with tart cranberry juice and a little clementine juice. My sister and I wake up at lien 5 or 6 am and make spaghetti on Christmas. One year we woke up when we were teenagers with our stockings on our bed and we were craving spaghetti so badly we raced downstairs and made it before even opening stockings (very rare) and ate spaghetti while opening our stockings that year. And now we still wake up early and make it every Christmas morning, now we get to have our coffee afterwards together before anybody else’s Wakes up. So random but it’s now a tradition I treasure, it’s magical!! Scones and coffee! Thanks for the giveaway! This year we are having sourdough cinnamon rolls. Favorite would be whatever someone else is fixing! next would be a coffee cake, fast & delicious, every time! Biscuits and black coffee. Simple but homemade and cozy!! Cinnamon Rolls, of course. Some are in the oven right now – five boys spent the night with my sons… and some are going to the freezer for a holiday breakfast treat! Would be delicious with a homemade espresso. Warm orange glazed cinnamon rolls is my favorite holiday breakfast! Overnight French Toast Bake and a little Bacon on the side!!! Happy Holidays!! Omg! All of these comments are making me hungry. Everything sounds delicious. Our tradition and has been for years is homemade FLUFFY cinnamon French toast. And let us not forget the extra crispy back and homemade fried potatoes. That looks amazing! I love all things breakfast, but scones and coffee cake are probably my favorites right now. Our go to holiday breakfast is French toast casserole or frittata. Gingerbread waffles! With whipped cream and fruit. Oh this looks amazing! 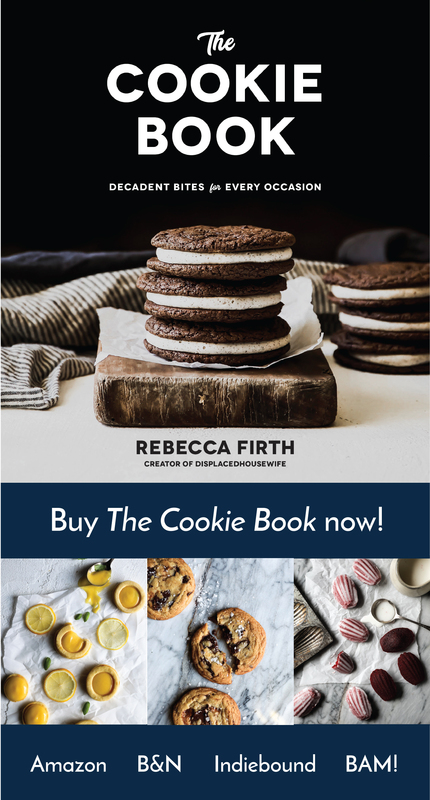 Every recipe I’ve tried from your blog Rebecca has always got 2 thumbs up! Holiday breakfast is usually a quiche and French toast with coconut syrup. Merry Christmas! Did someone say tart cherries? We adore anything with tart cherries & this cake looks amazing! Our favorite holiday breakfast is a baked egg casserole with a potato crust. Awesome giveaway…I’ve been lusting after a Nespresso espresso maker for months! Cinnamon rolls or sweet rolls always! Fluffy buttermilk pancakes with bourbon barrel aged maple syrup and melted butter. Throw in a pot of coffee and crispy bacon and I’m a happy camper! My favorite holiday breakfast is homemade french toast using challah bread with some cinnamon sprinkled into the raw eggs and enjoy with some cinnamon/sugar sprinkled on top. A wonderful braided yeast roll that is called “Walnut Twist” , fresh fruit salad and loaded scrambled eggs. Plus lots of coffee and tea! Thanks so much for this wonderful chance to win the Nespresso. Cream cheese braids and eggs benadict with lochs instead of Canadian bacon with tarragon. Loving your recipes!!! Christmas breakfast always coffee cake and some type of savory egg bake. My favorite holiday breakfast is cinnamon star bread! But we like to change the flavors, sometimes using jam, chocolate, or even making it savory for a brunch instead! Coffee cake with lots of streusal is a holiday morning treat must!!! Scrambled eggs, bacon, fruit and coffee too. A feast after tearing up all the gifts in the living room ! In our home, overnight French toast is the go to holiday breakfast. I can customize it, put it i a cold oven and by the time my crew is awake, the house smells delicious and breakfast is ready. Your coffee cake looks amazing and I will definitely be trying it out soon. Maybe do a “test run” before the hoarde arrives! Warm monkey bread is our fave! To be honest, I’m not terribly picky about breakfasts, but I do love it when my husband gets up early, grinds and brews some fresh coffee, and then makes pancakes for us. Fresh croissants with homemade raspberry jam. Slow cooked scrambled eggs with North Country Applewood Smoked Bacon, fresh squeezed orange juice and an espresso! Roasted brussel sprout leaves mixed with scrambled egg and cheese, homemade biscuits with homemade jam (right now plum cardamon is my favorite), and a cup of tea. I am a big fan of pancakes!! One of my favorites is lemon ricotta Yum!!! Much as I’d like to try something new for the holidays, cinnamon rolls win it every time. Sausage, egg, and cheese casserole with fresh fruit bowl and cinnamon rolls. Tradition! I love chocolate chip waffles for holiday breakfasts! Cinnamon rolls are my favorite o Christmas morning!! My absolute favorite is gingerbread overnight oats with a splash of cream. So yummy! My kids would tell you that theirs is the most decadent baked French toast casserole. My favorite holiday breakfast is definitely cinnamon rolls and I usually make my zucchini breakfast strata! We love Swedish Tea Ring or Eggs Benedict!! I grew up on having biscuits with chocolate gravy for Christmas breakfast. It sounds been in the family for generations with my southern Granny. Cinnamon French Toast – yum! Oatmeal pancakes with walnut butter…delicious! This recipe was published in the Oregonian newspaper in Portland, Oregon, in 2003 and comes from the Morning Glory Restaurant in Ashland, Oregon. My moms coffee cake is the best breakfast. It’s one of the only things she can make (the woman burned spaghetti for goodness sake!) but it is mind blowing. French toast with fresh fruit! Favorite holiday breakfast is panettone french toast with a maple latte! Many, many years ago I discovered a recipe for Maple Nut Twist coffecake in one of those little Pillsbury Bake Off cookbooks that you find by the grocery store register. Ever since, this has been the one staple of Christmas morning breakfasts and I only make it at Christmas. Every year I make fresh cinnamon rolls on Christmas morning. My family loves them. My favorite holiday breakfast is leftovers! I love to make potato cakes with the mashed potatoes and some sliced ham seared with a fried egg. My favorite is the spread we have Christmas morning. My dads side of the family has been hosting Christmas morning brunch for 52 years(!!! 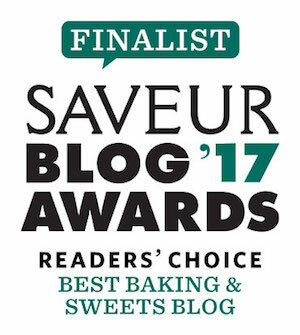 ), and although it’s changed a bit over the years, there are some tried and trues….hashbrown casserole, frenchtoast bake, and sooooo many cookies including Moravian cookies – the thinnest, most delicate cookies ever. Can’t wait for this years feast! My favorite are homemade flour tortillas hot off the griddle, homemade salsa and refried beans and pepper jack cheese made/shredded the night before. One of 3 instances I was ever allowed to sit on the kitchen counter. My favorite holiday breakfast is having croissants. Left to rise overnight, baked when we all awaken. My favorite winter holiday breakfast are aebleskiver &/or cardamom braid with almonds, with very strong cups of coffee, and good company. My favorite holiday breakfasts are Ebelskiver and/or Cardamom Braid with Almonds, with a strong cup of coffee, but this looks like a terrific option! My. Favorite holiday breakfast is French toast with powdered sugar and blue berries. I love a nice danish and good cup of coffee! I love sticky buns, cinnamon raisin toast, croissants, and baguette with butter and jam. But my all time favorite was the super thick caraway seed studded rye bread that my Polish grandma used to cram into the toaster then spread thickly with salted butter and sprinkle with cinnamon sugar. Still one of my favorites, though you can’t get decent rye in the wilds of North Idaho. I’ve been meaning to make cinnamon rolls…guess I’ll have to do it for Christmas. I’m all for make ahead special breakfasts! A Cheesy Sausage & Mushroom Egg Casserole that can be prepped the day before and put in the the oven in the morning along with a Coffee Cake made the day before and warmed up in the morning, and of course plenty of fresh hot coffee! Your Tart Cherry Coffee looks delicious and saved to my must make list! So hard to choose between iced cinnamon raisin buns and banana chocolate chip pancakes…I think I have to go with the cinnamon buns! Make a day in advance, proof overnight in the refrigerator and bake in the morning. . I love a nice coffee cake with my coffee, of course! Or a good egg casserole with potatoes and cheese. Also with coffee. Maybe both of those. Coffee cake is dessert for your breakfast. Chocolate croissants has always been a Christmas morning tradition in our family, with mimosas of course! If I’m being good a boiled egg and toast but if I’m not a warm homemade cinnamon roll! I love cinnamon rolls for breakfast on Christmas morning. The smell of cinnamon brings me back to my childhood. french toast soaked the night before. I love pretty much any baked good for breakfast. My favorites are double-baked croissants or danishes! It depends on whether or not I’m making it. My absolute fav when someone else is cooking are crepes topped with fruit and whipped cream :) When I’m in charge of the kitchen, I make easier fare: gigantic cinnamon rolls, hash brown casserole, scrambled eggs and bacon! I love chicken and waffles!!! Blueberry coffee cake is also a favorite…but maybe not after trying this one! egg casserole. It stores well overnight ,then you pop it in the oven and add some cinnamon rolls, hot coffee and you have a feast. This cake looks amazing, and I am definitely adding it to my list of must-make holiday recipes. One of my favorite memories is of watching my mother make the lattice top for her cherry pies for every family gathering. It wasn’t always easy to find canned tart cherries back then, but there would have been an uprising without those pies! What a great prize!! Favorite holiday breakfast would be cinnamon rolls! Definitely fluffy home made waffles with fresh berry compote topping. Delicious! Cinnamon rolls! 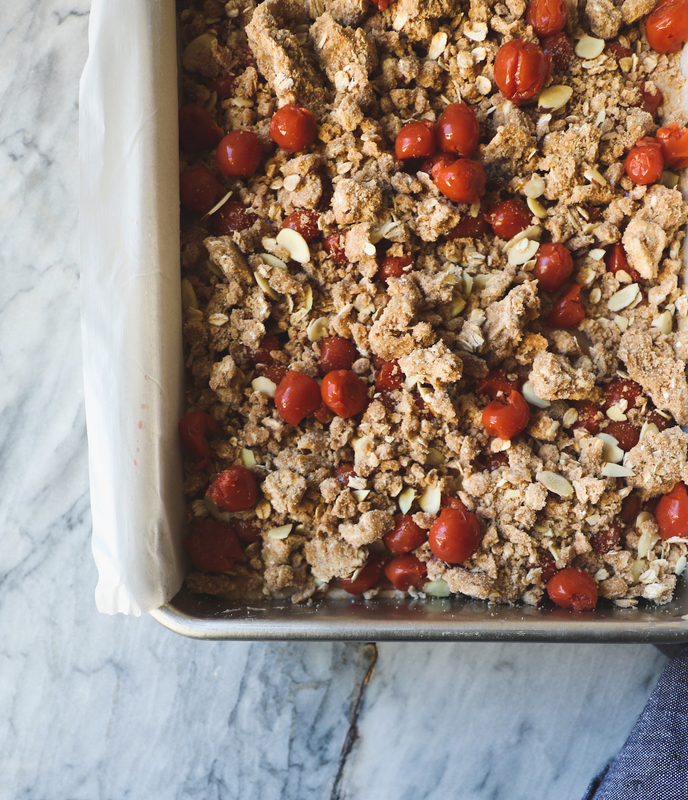 Or leftover apple crisp…does that count as breakfast? We like to make it easy and save room for dinner later. We usually have some nice warm croissants with butter and jam with plenty of coffee and tea. I like the idea of this coffee cake as a special treat for that morning. Fresh waffles with real maple syrup, fruit and espresso is the best holiday breakfast!